Ten Russian paratroopers captured inside Ukraine a week ago have returned home following a troop exchange, Russian media report. Russia's military said it had released 63 captured Ukrainian soldiers in exchange for the paratroopers. 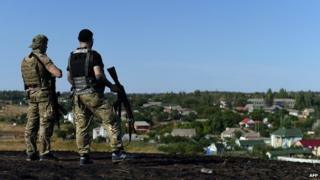 Pro-Russian rebels have made gains against Ukrainian troops in recent days in Donetsk and Luhansk in the east. The conflict in the east erupted in April following Russia's annexation of Ukraine's southern Crimea peninsula. Some 2,600 people have died in fighting so far. Major-General Alexei Ragozin, the deputy commander of Russia's paratroop forces, told the RIA news agency that negotiations had been "very difficult". "The talks were not easy, but common sense prevailed and everything turned out well" he said. However, he criticised the length of the soldiers' detention. "I find it unacceptable that the Ukrainian side kept our soldiers for so many days" he said. "Our lads are upset about everything that happened. They will all receive the necessary psychological and other kinds of help" he added. Ukraine released video interviews with the captured Russian soldiers last week. It says the soldiers were captured 20km from the border with Russia. Russia claimed that the soldiers had crossed in Ukraine "by accident" after inadvertently crossing an unmarked section of the border. The 63 Ukrainian soldiers released were said to have entered Russia to escape the upsurge in fighting last week.